We know that there’s a refurbished Samsung Galaxy Note 7 coming out very soon, but the date is still elusive. While we still don’t know the exact release date of the refurbished Galaxy Note 7, we might just have stumbled upon the official price of the phone on Korean carriers KT (currently Olleh), SKT and LG U+ (formerly LGT). It’s no surprise that these three carriers are showing up in the latest leaks. So far, we’ve already seen variants of the refurbished Note 7 pass through the Wi-Fi Alliance carrying model numbers that are associated with these three carriers. KT customers will get a refurbished Samsung Galaxy Note 7 or rather Galaxy Note FE that carries model number SM-N935K while those on the LG U+ will get a variant with model number SM-N935L. 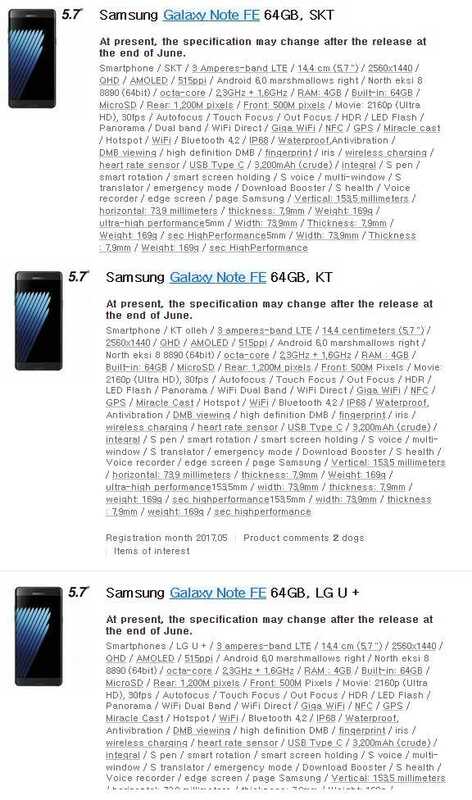 As for SKT users, the same phone will carry model number SM-N935S. Now, if the latest reports are to be believed, the three carriers will be selling the Note 7 at 699,600 Korean Won. When converted, this price tag comes to about $624, which is the same as what had been touted somewhere towards the end of April. The original Samsung Galaxy Note 7 was priced at close to $900 and if it’s true that the refurbished variant will be priced at less than $630, well, Samsung is indeed determined to use all means to recover some of the money lost through the recall. On the listings, the carriers also confirm that the refurbished Samsung Galaxy Note 7 will stick to every other thing that appeared on the original model apart from the battery unit, which drops from 3500mAh to 3200mAh. The Korean models will carry an Exynos 8890 SoC alongside 4GB RAM and 64GB of storage. The screen size and resolution are still at 5.7 inches and QHD, respectively. You also get IP68 dust and water resistance, a USB-C port, NFC, Bluetooth 4.2, as well as the same 12MP+5MP camera combination. One weird thing, though, is that the phone has been listed with Android 6.0 Marshmallow, yet the phone has been appearing on certification bodies with the new Android 7.0 Nougat.